By the Sixth Century A.D., Roman law was in jeopardy of collapse due to its sheer size and multitude of texts and increasing divergences. Ever since the Twelve Tables, the Romans had spoke of consolidation and codification of the vast body of the Roman law. It had been a recognized but unrealized dream of Julius Caesar. 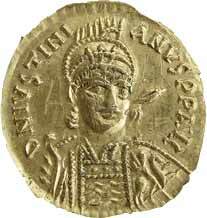 Just before Justinian's reign, his predessor Theodosius II (401-450) had tried a codification but had failed although he had established a complex system for sorting through the pile (see The Law of Citations). This problem, Justinian delegated to two able jurists, Tribonian and John of Cappadocia. They, in turn, worked through the writings of Papinian, Ulpian, Paulus, Gaius and others. The Codex, prepared under the chairmanship of the jurist John of Cappadocia, consolidated all pronouncements of previous Holy Roman emperors. The first edition, no copy of which survived, was published on April 7, 529. The Second Edition came out in 534. The Novels were issued last and became part of the Corpus but it was comprised of enactments which were subsequent to the Institutes, or amendments thereto. The Digests or Pandects, was an encyclopedia of existing writings of jurists on 50 legal topics. This encyclopedia was put together mostly by Tribonian but always under Emperor Justinian’sinterested eye. There was a plethora of texts to select from and the exercise was not without some controversy as many jurists found that their written opinions did not make the final selection. The Digests was published on December 16, 533. The Institutes were the meat and potatoes, literally the “basic principles” of the Corpus, and where the actual rules of law were to be found. It was first published on November 21, 533. An extract of the Institutes is available here: Institutes of Justinian.pdf, translated from Latin to English. The extract includes the first pages only, as representative of the content and style. The Institutes has been the basis of Roman and civil jurisdictions which includes almost the entirety of Europe. “It is of the law as it stood just then that the Institutes present us with the picture in miniature. And it is a picture that has never been withdrawn, though the precise state of things which it represents rapidly passed away. “The three fundamental maxims of law are ... to live morally, to injure no one (and) to render unto every man his own. “Justice is an unswerving and perpetual determination to acknowledge all men’s rights. “Leaning in the law entails ... mastery of the difference between justice and injustice. “The commandments of the law are these: live honourably, harm nobody; give everyone his due. "The main classification in the law of persons is this: all men are either free or slaves. Slavery ... makes a man the property of another, contrary to the law of nature. “The offspring of slave women are born slaves. Equally he is born free if his mother is free and his father a slave.... It is enough for the women to be free at the time of birth though a slave at conception. “A freedman is someone who has been manumitted from lawful slavery. Manumission is the grant of freedom. “A Roman law marriage is a marriage between Roman citizens.... Males must have reached puberty. Females must be sexually mature. “The Julian Act on the Suppression of Adultery ... puts to the sword not only those who treat with contempt the marriage of others but also those who dare to indulge their unspeakable lust with males. And thus was Roman law not only saved from drowning in treatises and opinions but at the same time, it was refitted and re-launched to a level of adoption unparalleled except, arguably, by the later international scope of the English common law. Birks, P. and McLeod, G., Justinian’s Institutes (London: Gerald Duckworth & Co., 1987), page 7. Holland, Thomas, The Institutes of Justinian (Oxford: Clarendon Press, 1881), pages x-xi. Justinian coin shown is in the British Museum, London. 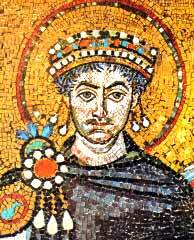 The image of Justinian is extracted from “Mosaic of Justinian and Retinue” at the Basilique San Vitale, Ravenna, Italy. Schultz, F., Principles of Roman Law (Oxford: Clarendon Press, 1936), page 7-8.